Yesterday we headed to Petsmart after school to pick up some hay for our guinea pig Stormy. While there we checked out the baby guinea pigs and although I think they are adorable we don't have the space for another cage and Stormy's is just too small. It would be cruel. So instead we found a Halloween Costume section for guinea pigs. Who knew they even had these? Obviously not me! There was a spider, a pumpkin, a bumble bee and a devil. Goddess and Handsome were both devils for their first Halloween so why not Stormy? Now that is so cute. 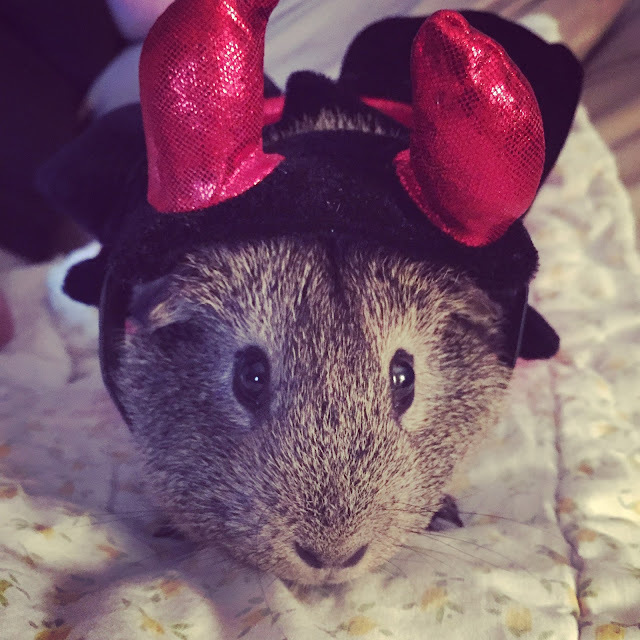 My sister years ago used to have guinea pigs. They had such delightful personalities. That's just adorable. I had a guinea pig as my first pet many years ago, and sometimes I think about having another one. They are such darling little critters. Yours looks extra cute in its costume!